Major damage to control rods, including cracks in over 40 places, was first identified in Toshiba control rods at the Fukushima I-6 reactor on January 1st during a periodic inspection. Since then damage has been found at other reactors as well. The affected control rods are hafnium blade type. Hafnium is used as a neutron absorber. The control rods are used to control power output and are partly inserted into the core. As shown in the diagram below, each thin hafnium blade is enclosed in a steel sheath. Four blades are joined with a tie rod to make a single control rod. The problems relate to the numerous cracks which have appeared in the sheaths and tie rods, and the damage to the sheath that seems to have developed from these cracks. 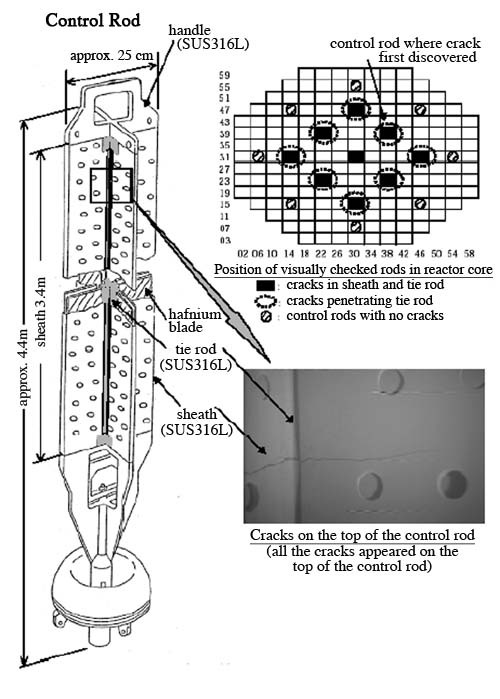 Crack damage has been found in 9 of the 17 hafnium blade type control rods in use at the Fukushima I-6 reactor. In all, 382 hafnium blade type control rods are in use in Japan's Boiling Water Reactors (BWR). A further 207 are in storage having completed their useful life. As of March 7th, inspections had been completed for 134 control rods still in use. Besides Fukushima I-6, damage and cracking was found in 5 of the same type of control rod at Fukushima I-3. In addition, 157 of those no longer in use had also been checked and 32 anomalies found: 8 at Fukushima I-5, 9 at Kashiwazaki-Kariwa-2, 2 at Kashiwazaki-Kariwa-6, 13 at Hamaoka-3. The Nuclear and Industrial Safety Agency (NISA) says that the damage is related to the degree of cumulative irradiation. On February 3rd it directed power companies operating BWRs to fully insert all hafnium blade type control rods for which the cumulative thermal neutron irradiation dose exceeds 4.0 x 1021 neutrons/cm2, or is expected to exceed this level during the current operating period. The idea is to insert them into the core before they break. If that were to happen it would no longer be possible to insert them. Continuing to operate the reactors under these circumstances is highly irregular. In the case of Hamaoka-4, for example, this means that 21 control rods have been fully inserted, reducing the power output by 400 MW to 700 MW (62%). Control rods are a nuclear reactor's brakes. There couldn't be anything more dangerous than operating a reactor with these not fully functional. Both the La Salle 2 power oscillation accident (1983) in the US and the Chernobyl disaster (1986) in the Ukraine occurred at reduced power output. In order to avoid a catastrophe, the power companies should immediately stop the reactors and carry out a thorough check. The sheaths and tie rods are made of SUS316L stainless steel. It was assumed that hafnium control rods would be employed as neutron absorbers for extended periods of time, so SUS316L was chosen to replace SUS304, because it was believed to be less prone to stress corrosion cracking. However, it is known from irradiation experiments at US experimental reactors and BWRs that stress corrosion cracks appear in SUS316L under cumulative fast neutron irradiation doses of more than 1.0 x 1021 neutrons/cm2. Therefore, it (SUS316L) cannot be said to be very effective. When high burn-up fuels and MOX fuel are used, the situation will become even more serious than when the object is to operate reactors for long periods of time. NISA's directive relates to control rods where the cumulative thermal neutron irradiation dose exceeds 4.0 x 1021 neutrons/cm2, but cumulative irradiation by fast neutrons generally exceeds this by quite some margin. Also, judging from past accidents, there is a high probability that stress corrosion cracks will appear or be latent at even lower irradiation levels, so the scope of the inspections should be expanded. The same can be said about other types of control rod. Judging just from recent examples, stress corrosion cracks have appeared in hafnium flat tube type, hafnium rod type and hafnium - boron carbide type control rods, so inspections should not be restricted to hafnium blade type rods only. During the 2002 Tokyo Electric Power Company scandal, attention was focused on cracks in SUS316L. Then in 2003 cracks were found around welds on the handle of the hafnium blade type control rods. It is therefore hard to believe that power companies have not carried out checks for cracks in control rods before. Indeed, the discovery of cracks in used control rods suggests that previous discovery of cracks has been covered up.